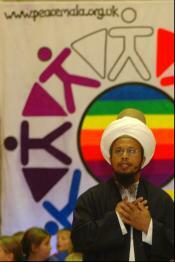 Sheik Ahmad Dede is a man of deep spiritual devotion and peace. During his youth he had spiritual dreams and visions which changed his life completely. The story of how Ahmad became a whirling dervish of the Mevlevi Naqshbandi Sufi Order is fascinating to read. 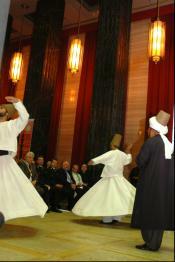 Much has been written and researched about the 'Sema' or The Whirling Dervish Ritual. The Naqshbandi Sufi Order followers have been given permission from Grand Sheikh Nazim to practice it. Maulana (pronounced Mevlana in Turkish) Jalaludin RUMI is the Great Grandfather of Sheikh Nazim through his mother's side of the family. The whirling of the Dervishes is an awesome sight to behold. Devotees can whirl gracefully for hours, in total worship, in total harmony with the great whirling of creation, from the atoms around the nucleus to the huge and countless galaxies, all whirling passion and awe of the Creator . . . Jalaludin RUMI would actually levitate as he whirled and attained unprecedented levels of nearness to God. All who attended the 2006 Peace Mala National Awards for Youth, witnessed 20 minutes of this whirling meditation. It was a graceful and beautiful sight, which brought everyone present to a standstill of balance between high energy and inner calm. The hypnotic rhythms, haunting vocals and graceful, meditative whirling of the Mevlevi Dervishes, created an incredible sense of calm, unity and tenderness.